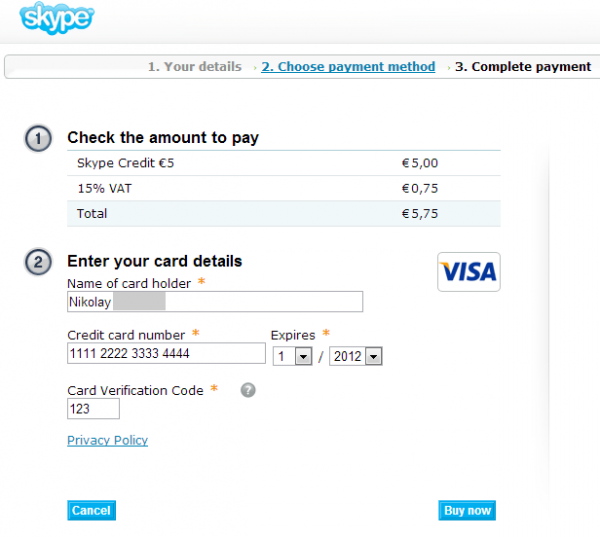 How To Buy Skype Credit? In this post I will guide you trough the process of purchasing Skype credit. 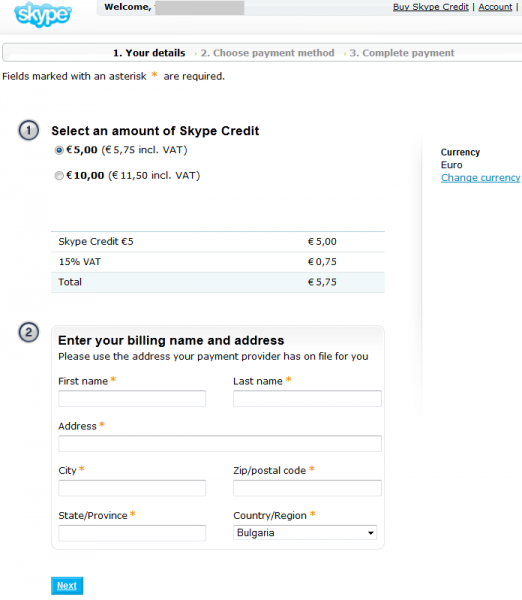 This credit can be used for various paid Skype services including calls to telephones or mobile phones, sending text messages and others. 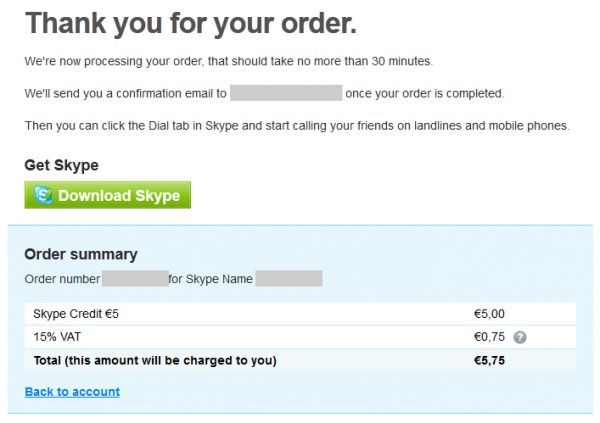 This article is only about the process of buying the Skype credit. We are not going to talk about spending it. There will be a separate article for that in the future. Security note: Before you shop online, always make sure that your computer is protected by an antivirus software and a firewall. Also never share your personal or payment data with websites that you do not trust. 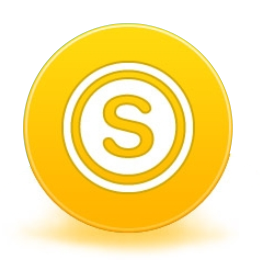 Visit the page for purchasing Skype credits. Sign in with your Skype name and password. If you don’t have a Skype account, you can make one for free. Choose the amount you want to spend and then fill in your personal data below. 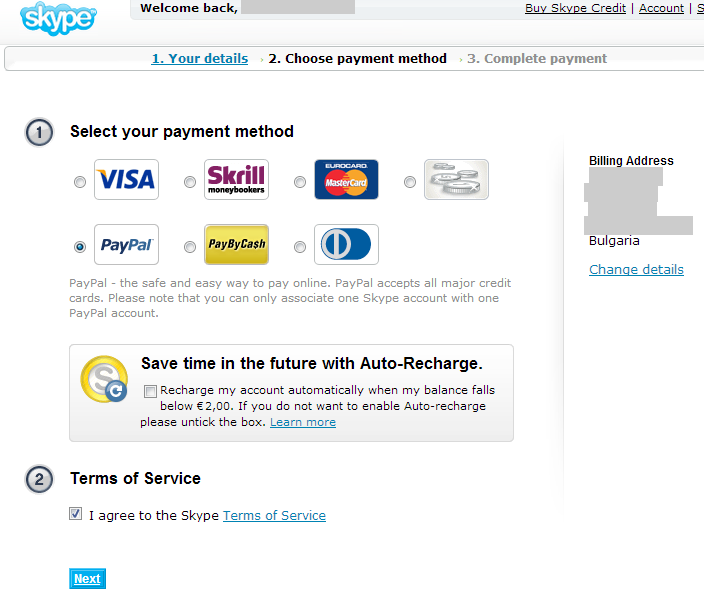 Since I am from Bulgaria (which is in Europe), and since they don’t support the Bulgarian currency, I am using euros. You can change the currency from the link to the far right in the picture below. When you are done click Next. In this step you must first choose the payment method. After that you must decide if you want to uncheck the checkbox below Save time…. If you leave it, Skype will refill your credit when it is below a certain value. After that agree to the terms of service and click Next. If you are paying with PayPal, like I did, you will be redirected to PayPal.com in order to make the payment. 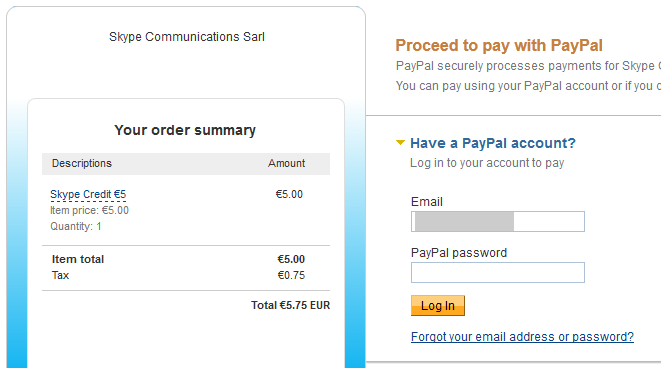 Sign in with your PayPal email and password and then click Continue. 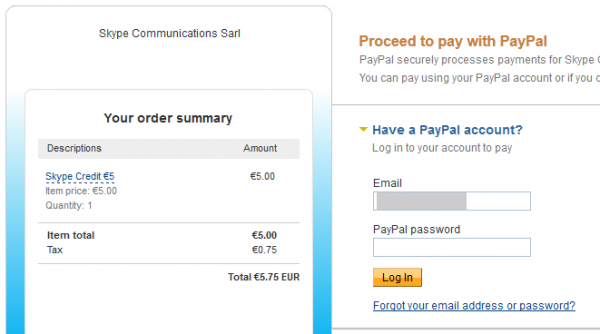 If you are paying with Visa, you will see a page where you must fill in your credit card details. Write the data as it is on your credit card. Judging by the number of characters allowed in the Credit card number field, you have to put a space after each 4 digits from the 16 digit number on the front of the credit card. The expiration date is also on the front and the Card verification code if located on the back. It consists from the last three digits. Click Buy Now when you are done. 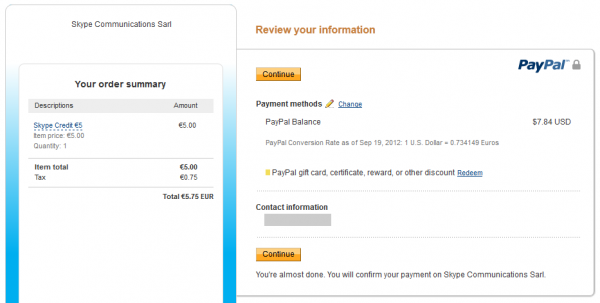 If you are paying with PayPal you will be redirected back to the Skype website and you will see the message shown in the picture below. I assume that the same applies for the other payment methods as well. 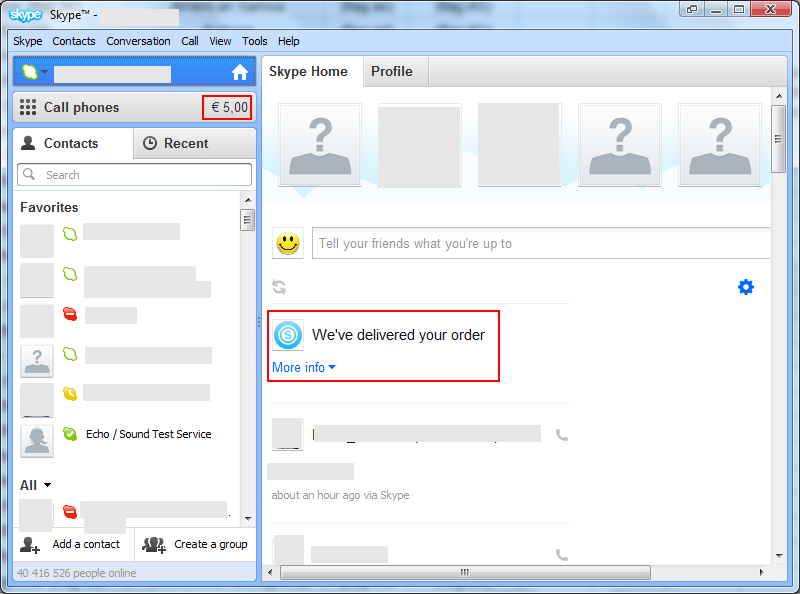 You can see the credit by logging in Skype. You will receive a notification there as well. The idea for this article was suggested to me by the visitor Policexpert in the Bulgarian version of the site. You can give me an idea too. Use the the comments or send me an email.